In the wake of the high debt burden and the broke treasury, the government has now issued a Statutory Instrument to increase the prices of drugs. According to Statutory Instrument number 38 seen by the Zambian Watchdog, the Pharmacy Regulatory Authority is proposing almost a hundred percent increment on both human and animal drugs. The net effect of this measure is that mist drugs will be out of reach of ordinary citizens in the country. Most Zambian hospitals are shells that do not.have drugs as citizens are referred to Chemists to purchase vital drugs. Just the other day the Patriotic From again bulldozed a decision in Parliament to increase taxes on fuel. Zambians must brace themselves for even harder time in 2019 and beyond. If there is anything Zambians must reject is this SI 38 as if affects the most vulnerable of the country. 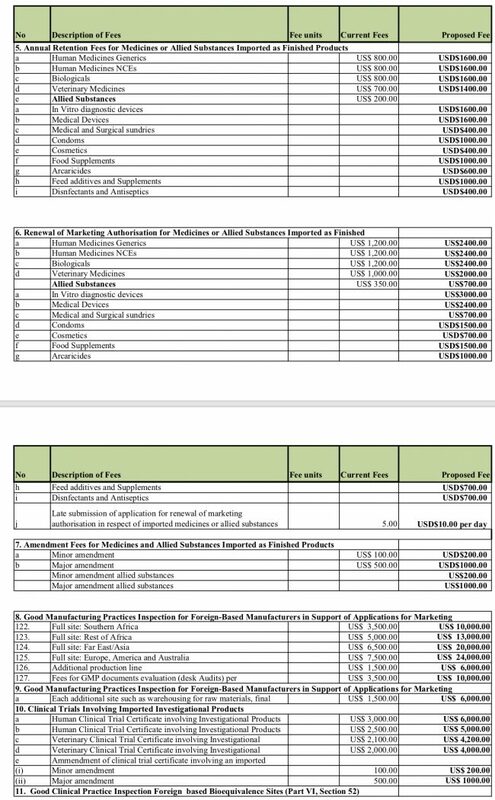 Below are the new proposed fees by the pharmacy regulation authority. If passed, the net effect will be that the cost of medicines will go up exponentially as all the fees have gone up by at least 100%. Some by up to 10-15 times. This is going to affect the poorest among us the most.